3-way fluid head with swivel handle and two twist knob can provide 360 degree rotating panoramas, 90 degree lateral tilt and 180 degree tilt angle adjustment. Panoramic shots are a breeze, and shooting from slightly different angles is easy. The Zecti Tripod is a great choice for photographers and videographers alike. It comes with it’s own carry case, and in it’s most compact form it measures just 22″/57cm. There are little feet on the bottom that can move around allowing you to use the tripod on lots of different terrain types. 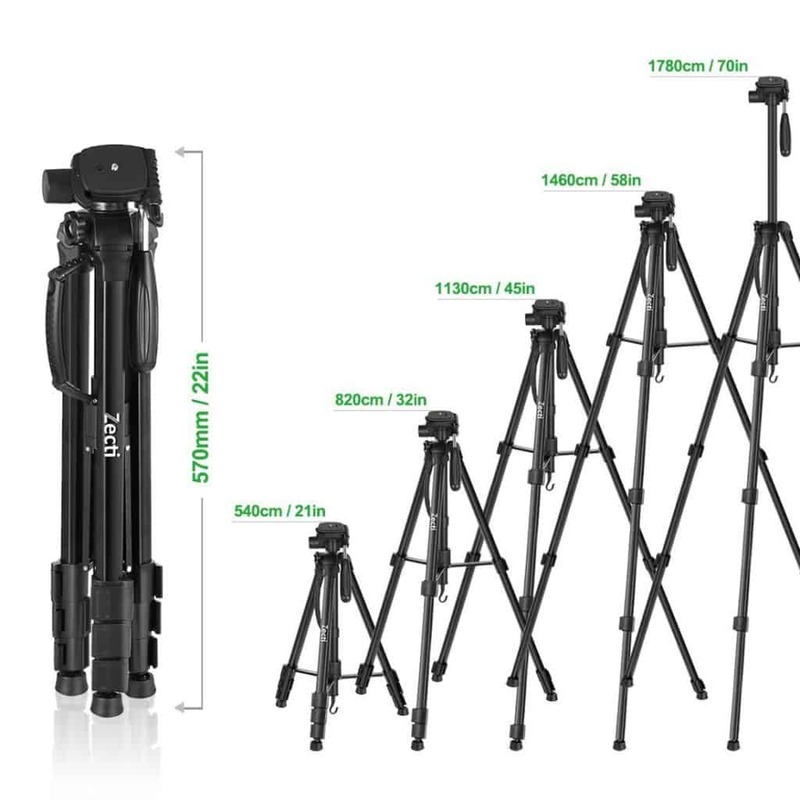 Although this starts off compact the legs extend to give you about 58″/14.6cm of height, which can be increased to 70″/17.8cm by extending the tripod neck. There is a small level bubble on the mid section, a handy location as other tripods used have positioned this near the camera where it can be easily covered up. You also get a hook on the bottom allowing you to add additional weight if required. The tripod head features a quick release plate, you attach it to your camera or camcorder and you can quickly detach your equipment from the tripod for handheld use. While functionally fine the quick release plate is the one area that doesn’t feel as premium as the rest of the tripod, but so far this hasn’t caused any problems. Although it’s been referred to as a tripod Zecti have actually made a fantastic bit of transforming kit as you actually get both a tripod and a monopod. The extendable tripod neck on many tripods is fixed to stop at a certain point to prevent it coming out of the tripod body. In this case the neck is actually designed to be removed from the main body as it is the monopod! 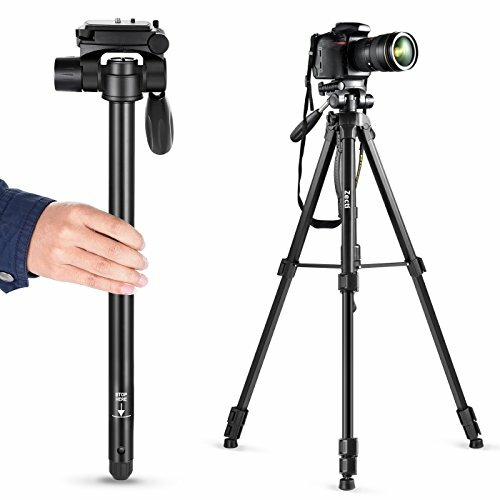 This monopod starts off small but can be quickly extended to be 65″/16.5cm tall. This is done by twisting the pole to first release them, then twist back to lock them in place. The monopod takes a bit of practice to expand and there are times when you’ll think you’ve got it but then it’ll collapse on one section, but overall it’s an ingenious way to combine two useful camera gadgets into one. Considering the two in one nature of this product it’s really good value for money if you’re looking for a decent quality bit of kit that doesn’t cost £100+. More Convenient and Lighter Monopod - By pulling out the center column from the tripod it can be converted easily to a 5 section monopod. Light-weight but durable, easy for outdoor photographers to carry and transport. The tripod with 1/4 3/8 screw mount is applicable for all kinds of Digital Cameras, Lenses, Most Camcorders, GoPro Devices, Binocular, Telescopes and Universal Phone Clip. The Zecti tripod legs of camera tripod are made of high quality aluminum alloy and combine lightness with maximum stability. The gravity hook and horseshoe foot provide excellent stability no matter you are shooting indoors or outdoors. ★Warranty and Service: If you have any questions about our products, please contact us! We try to get back to you within 24 hours. And provide a one-year replacement service!